« Do we cater for the jazz guitarist ? A tale of two “Champs”. 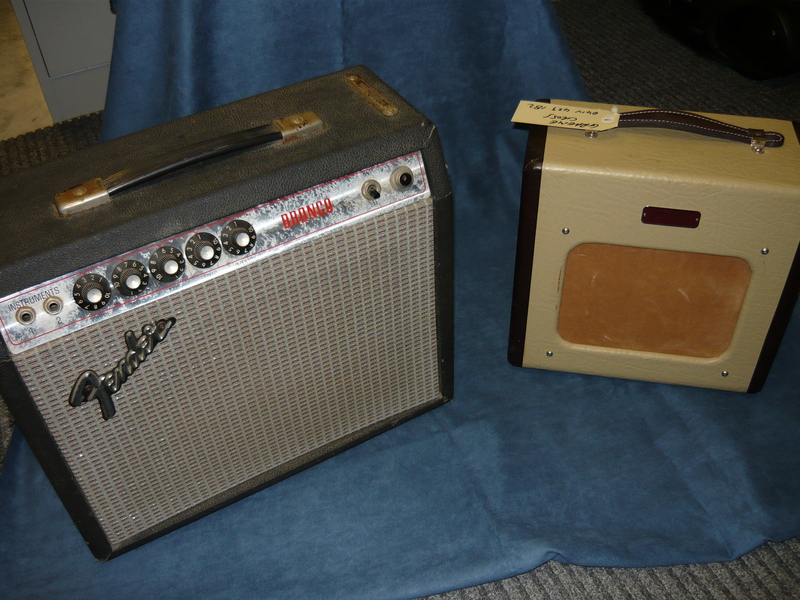 A pair of Fender “Champs” arrived at the workshop this week for servicing. 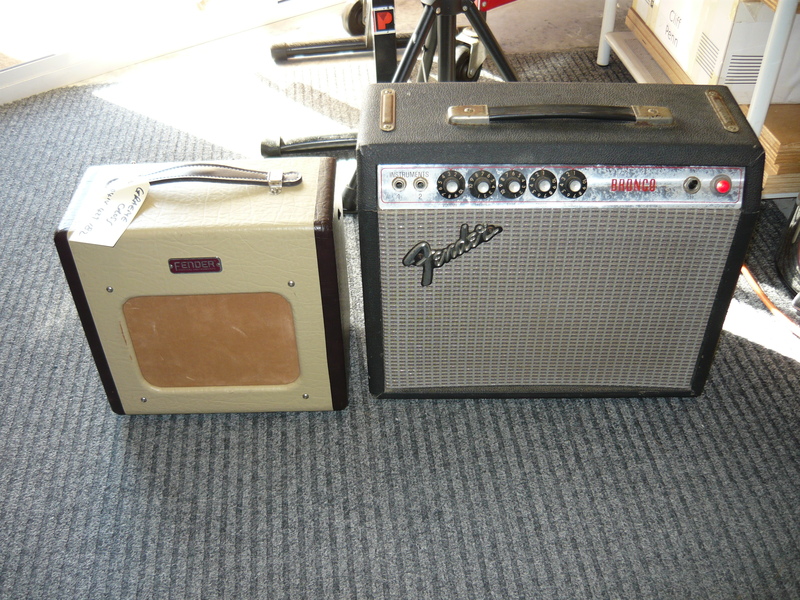 Actually, one of them is a Silverface Bronco amp, which to all intents and purposes is a Fender Vibro-Champ. The other is a current manufacture (ie, China) Champion 600 amp. 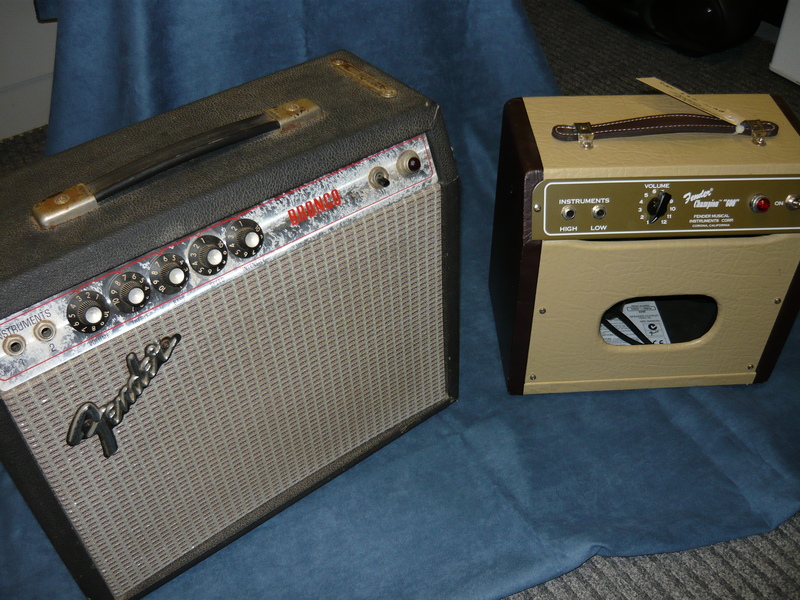 Both amps have very similar electronic design excepting that the Vibro-Champ has valve (tube) driven Tremolo, and a valve (tube) rectifier, whereas the Champion 600 has solid-state rectification, printed-circuit board construction and a preset tone-stack so there is only a volume control presented on the front panel. The Bronco has a much larger cabinet, which helps enormously to develop a bigger sound. The Bronco needed a fairly comprehensive service. This not only included replacement of all valves (tubes), but also damaged pots (potentiometers), ageing electrolytic capacitors, and a 9-pin valve socket which was no longer providing reliable connection. Our usual electrical safety standards inspection and testing revealed that the 240V 3-pin plug was due for replacement, too. The Chamion 600 was powering up but nil output, ie the lights are on but nobody’s home, as they say. The cathode-bias resistor for the 6V6 valve (tube) in this amp is a little under-rated for the job, especially if the 6V6 suffers a catastrophic failure, so I replaced it with a ceramic-body 7 watt resistor intended for the most demanding environments. I use these resistors where appropriate in my own Richards custom amps. The 2 x boards checked out OK, as did the jacks, interconnects, and so on, but the 2 x valves (tubes) were cheapo examples of Chinese origin, and the volume control was very scratchy indeed, so these items were replaced. Both these amps have small, very cheapo speakers, so naturally the amps sound much bigger and better through a decent quality external speaker. However, many people love how compact and lightweight these amps are, and of course 1000’s of recordings over the decades have been done with the Champ amp. So in the final shoot-out, how did these amps compare ? The basic tonality is very similar. They common circuit design is quite low gain, so you have to turn up the volume control most of the way to get much of a vibe happening. The Bronco/Vibro-Champ has a bigger sound with greater prescence and throw, and the advantage of 2-band EQ, but most of all it has a great valve-generated tremolo which is superior to any stompbox tremolo that I have heard so far. The tremolo is of the direct-modulation configuration, which varies the bias and gain of the 2nd stage of the preamp 12AX7 valve (tube). For tremolo lovers, it doesn’t get much better than this. For all owners of small valve (tube) amps such as those described above, I offer world-class professional amp repairs from my workshop located in Wyoming (Central Coast) NSW. We have couriers delivering and picking up to this site every working day, so please consider the level of service and value add that we can supply. That’s all for today’s BLOG, please check in every week or so for more news and info. regards – Ivan. This entry was posted on July 2, 2011 at 10:42 am and is filed under Amp Repair, Amps. You can follow any responses to this entry through the RSS 2.0 feed. You can leave a response, or trackback from your own site.